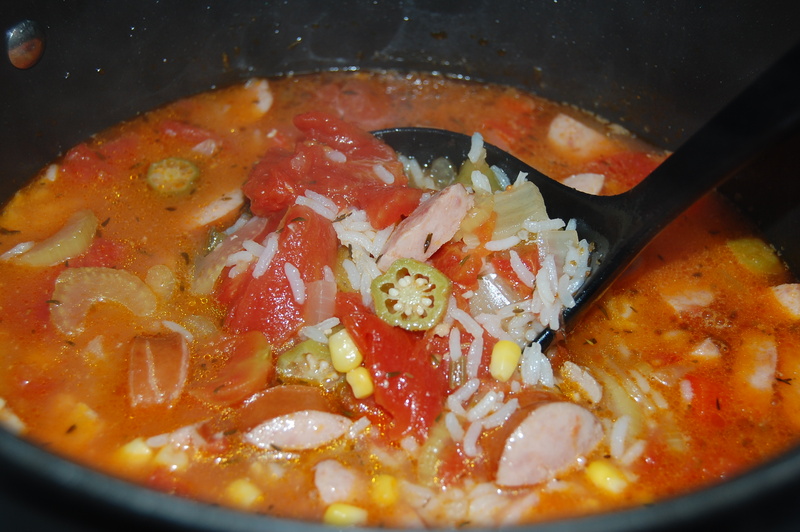 A classic chicken gumbo with spicy smoked andouille sausage, vegetables and rice. Using a chef's knife, trim chicken and cut into 1-inch pieces. Heat oil in a 6-quart Dutch Oven over medium-high heat 1-3 minutes or until shimmering. Brown chicken in two batches, 2-3 minutes each or until outside surfaces are no longer pink. Return chicken to pan. Add broth, tomatoes, water, garlic pressed with garlic press, hot sauce, oregano, thyme and bay leaf. Bring to a boil. Add vegetable mixture; return to a boil. Cover; reduce heat and simmer 10 minutes. Meanwhile, cut sausage links into 1/2-inch slices; cut slices in half. Add sausage and rice to gumbo. Cover; simmer 10 minutes. Remove from heat; remove and discard bay leaf before serving. Serve with Corn Muffins, if desired. 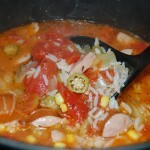 Cook's Note: Frozen gumbo vegetable mixture is a combination of okra, celery slices, chopped onion, red bell pepper and corn. For a milder version of this spicy stew, substitute smoked sausage for the andouille sausage and reduce the hot sauce to 1/2 teaspoon.